If you only go to one place in New Zealand, let it be Queenstown. Surrounded by towering mountain ranges, including the magnificent Southern Alps, Queenstown is a world-class, four-seasons alpine wonderland. But it’s not just spectacular scenery and skiing that’s on offer – Queenstown is considered the adventure capital of New Zealand, and also serves up phenomenal shopping, dining and nightlife. 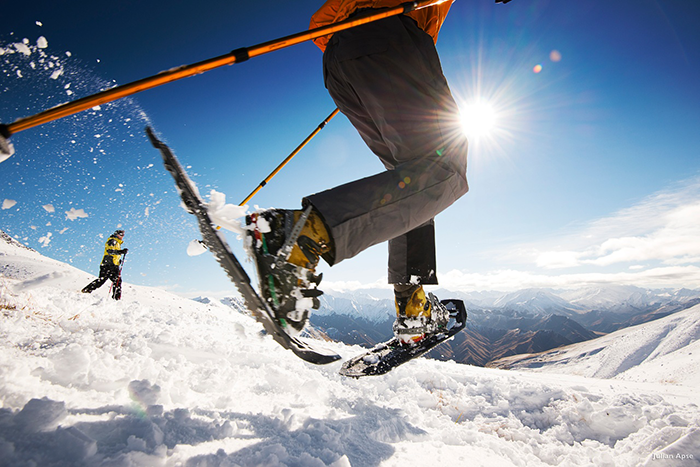 Queenstown is New Zealand’s most prestigious snow sports destination. There are four massive ski fields to choose from – Coronet Peak, The Remarkables, Cardrona and Treble Cone. All four are within easy reach, and each offers a virtually endless range of very open and treeless terrain, for all abilities and styles. Night skiing is available, as is heli skiing – letting you experience the most pristine fresh-powder runs of your life. The skiing infrastructure here is world-class, attracting millions of visitors each year. 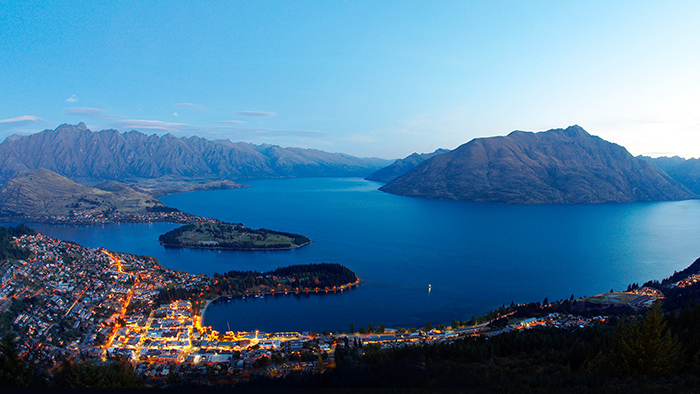 Queenstown also boasts one of the longest seasons in the Southern Hemisphere (June to October). When other destinations are done for the season, Queenstown is often still pumping. 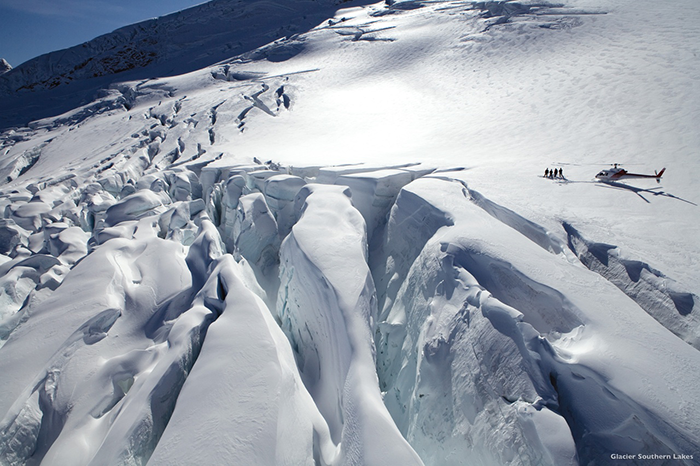 If you’ve been thinking of booking a luxury ski holiday in New Zealand, get in touch with us. We have so much to share with you, and this one page is not enough space to express how fabulous the skiing in Queenstown is. The scenery here is beyond words, beyond even photographs. To experience it in all its glory, let us arrange a helicopter tour for you. Touch down on an isolated mountain peak above the clouds, follow the course of a raging white-water river, see breath-taking glaciers (we can even arrange for you to land on one of these ancient rivers of ice) or be taken to Queenstown’s most exclusive spa, accessible only by helicopter as it is set high on remote clifftops. 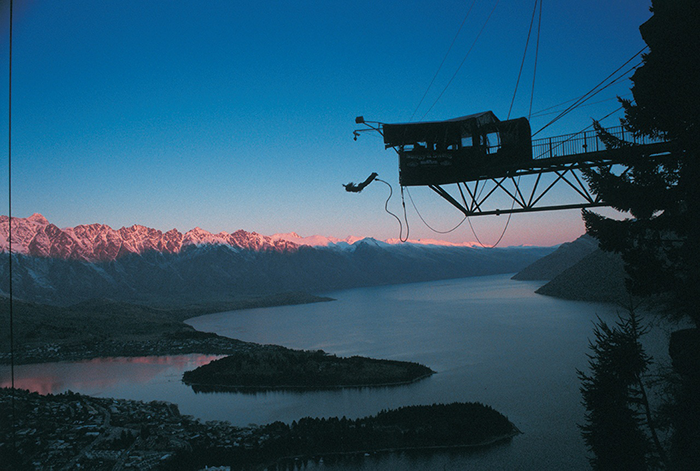 Queenstown is a mecca for thrill-seekers, and offers some of the finest adventure tourism activities in the world. In fact, a number of adrenalin-pumping activities were actually invented here in New Zealand – including bungy jumping and jet boating. Queenstown is the world home of bungy jumping – that is, leaping off a bridge, tethered by your feet to a giant bungy rope. It was pioneered here back in 1988, at the historic 43-metre high Kawarau Bridge. Take the leap alone or go tandem - strapped to a friend. 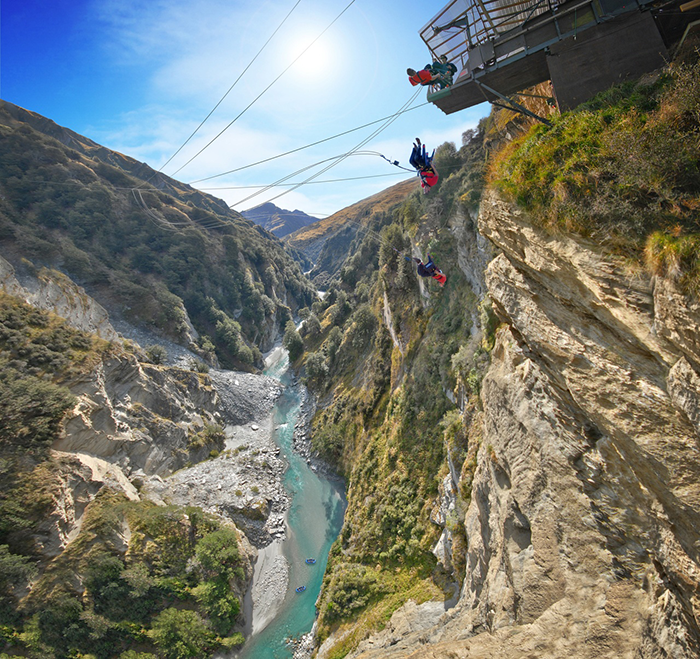 Queenstown also boasts the Southern Hemisphere’s highest bungy (set 134 metres above the Nevis River), and the world’s biggest Swing. Imagine being lifted up, up, up to 160 metres above a canyon floor, being suspended there for a few agonising seconds, then being suddenly released and literally flying through the valley at speeds of 120kph (75 mph) plus, in a 300 metre arc! 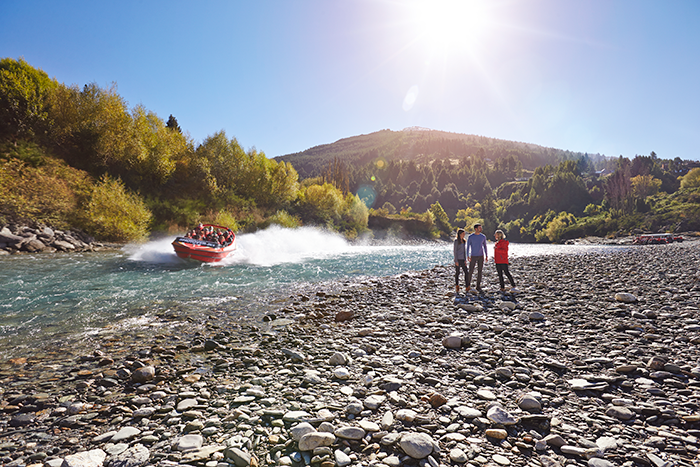 On the Shotover Jet, you’ll reach impossible speeds as you ride through the impossibly narrow, dramatic canyons of the mighty Shotover River. Hold on tight as your Jet Boat spins 360-degrees. You’re likely to get soaked, but it feels amazing! While bungy jumping and jet boating are two of the most iconic adventure activities here in Queenstown, there’s plenty more besides. Zip-lining through native bush, luging or hang-gliding down a mountain side (epic! ), white water rafting and river surfing, and much, much more. Ask us about the other once-in-a-lifetime adventures available in Queenstown. 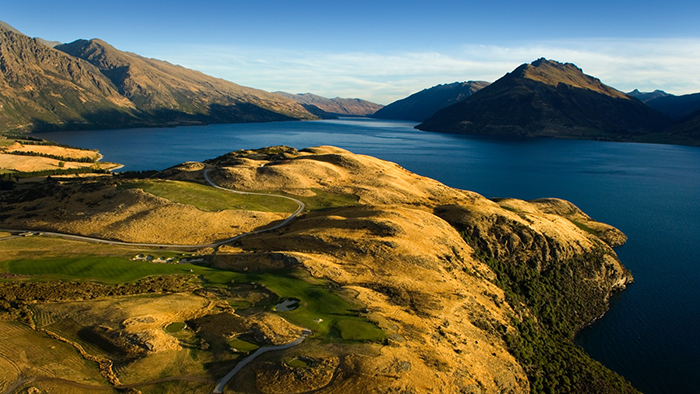 There are at least 6 premium golf courses all within a 25 minute drive of Queenstown’s centre. And while they all offer varying par levels and unique course challenges, they share one thing in common – unforgettable scenic views. If you only have time for one round, we recommend Jack’s Point. This 18 hole, par 72 championship course is known as one of the most spectacular courses in the world – you’ll be playing with 2300 vertical metres of magnificent mountain range as your backdrop. The 6,538 metre course weaves its way through wild and dramatic high country terrain, with play that takes you to the edge of steep bluffs and to the lapping shore of an alpine lake. Queenstown has made a name for itself on the international wine stage. The world’s southern-most wine growing region, it is most famous for its highly-acclaimed Pinot Noir. Other impressive local varietals include Gewurztraminer, Riesling, Pinot Gris, Chardonnay and Sauvignon Blanc. Queenstown is located at a similar latitude as Burgundy, France. This part of the world has extremely hot summers, very cold winters and long, dry autumns – creating the perfect soil and climate for grapes to grow. 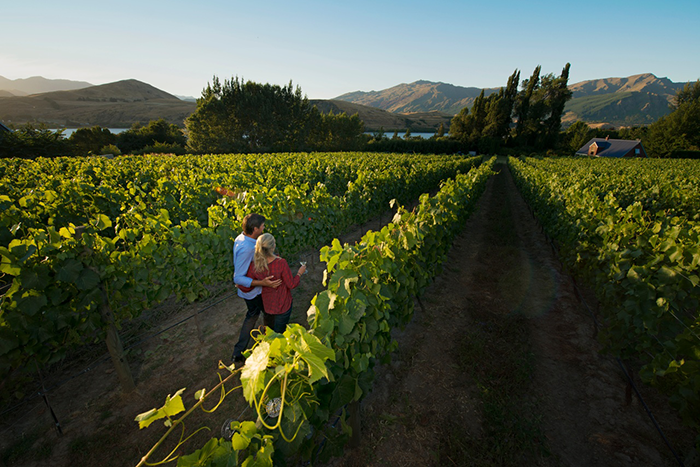 Let us arrange for you a tasting tour of the best vineyards of the lush Gibbston Valley, visiting cellar doors, sampling gold-medal-winning vintages, and even meeting with the winemakers themselves. Let us plan an unforgettable itinerary for you. We’ll make sure your tour includes the pick of the crop - the vineyards with the most spectacular scenic views, the finest restaurants, the most impressive architecture and the richest history. In terms of shopping, dining and nightlife, Queenstown is more of a sophisticated city than a ‘town’. Getting around, though, is easy – Queenstown’s centre is very compact and pedestrian-friendly. Start your days with breakfast and a seriously good espresso (New Zealand excels at coffee!) at one of the scores of top-quality vibrant cafés, then stroll the streets to shop at luxury and international brand flagships, iconic New Zealand design stores and high end fashion boutiques. 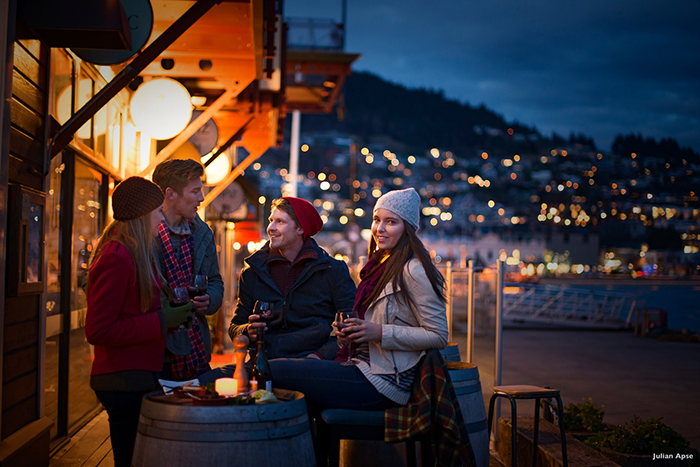 Savour long lunches at contemporary, cosmopolitan eateries, but save some energy for after-dark – Queenstown has a buzzing nightlife. Ready for the trip of a lifetime, experiencing all these things and more? We are Singapore's premium New Zealand travel specialists and can arrange every last detail of an amazing New Zealand holiday for you and your family... get in touch with our team and let's start planning!